Drought, Wildfires Force Ranchers To Look For Efficiencies Ranches and feedlots are looking to cut their feed costs in the short term and even have an eye on making the cattle themselves more efficient. The people who raise cattle destined to become steak or hamburger on your dinner plate are feeling the pinch. Wildfires this summer have scorched more than a million acres of Northwest rangeland. In addition, the Midwest drought is driving up feed costs across the board. Now ranches and feedlots are looking to cut their feed costs in the short term... And longer term, have an eye on making the cattle themselves more efficient. The cost of feed is by far the biggest expense on the ledgers of most Western beef farmers. Since summer, a host of different feeds led by corn have flirted with record highs. Washington cattleman Jack Field is going to great lengths to postpone or avoid buying hay at sky high prices. It's so expensive he's made plans to truck his small herd halfway across the state, then move again later, to graze on crop stubble. "The transportation is a little bit of a pain," Field says. "It is expensive, but by moving cattle around if I can keep from having to feed hay, I can make that pencil and profit in my situation." Fortunately for Field, none of his rented ground has been scorched by wildfires. But others are not so lucky. It's been a bad year. 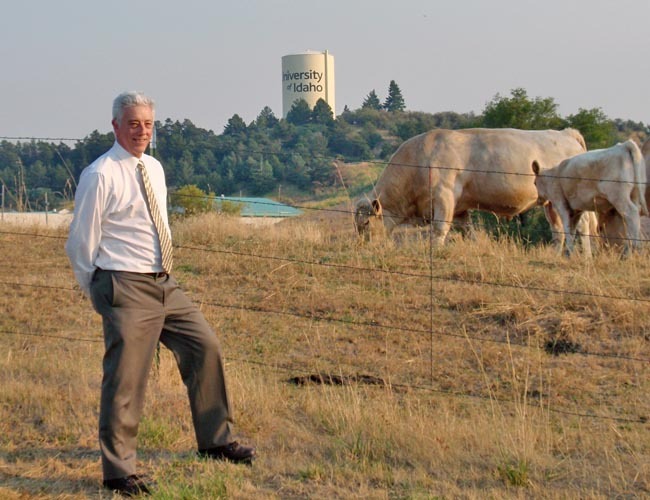 Oregon State University beef scientist Tim DelCurto is working with ranchers and feedlot owners to analyze alternatives. He says there are options for lower cost feed: Grass seed straw, distillers grains leftover from ethanol production, cannery waste and potato processing byproducts such as misshapen green beans, carrots and even French fries. "I think one of the unique attributes of beef cattle, and sheep fit this too, unique attributes of ruminant animals is that they can digest virtually anything," DelCurto says. Later in October, DelCurto will be a guest speaker at several University of Idaho Extension seminars offering cost saving tips to cattle ranchers. The focus is on short term relief, but there's also news about longer term strategies. Ag research universities are giving greater attention to something called "feed efficiency" given the rising cost of fodder. In a cattle barn at the University of Idaho, professor of physiology Rod Hill points out sensors and electronic gates on feed bins. They allow him to track exactly how much food each cow eats. The cows also have to be coaxed onto a scale periodically to calculate how efficiently each converts the fodder into beef. Hill says the amount of variation within a herd might surprise you. "These animals for your eye and mine, they look quite homogenous. But the variation in intake for animals growing at the same rate is of the order of 35 percent." This is a case where humans and cows have something in common. "We talk to people who say, 'All I have to do is look at the candy store and I put on three pounds,'" Hill says. "We don't actually quantify it quite so precisely in humans, but we know in humans that some people can eat a little and they put on quite a bit of weight and some people can eat a lot and hardly put on any weight. It's a biological phenomenon." A newly published animal science book that Hill edited explains how ranchers can use selective breeding to achieve the same growth with less feed or less environmental impact on rangeland. But he warns there is risk in focusing too much on one trait. "Less efficient animals are slightly fatter," he explains. "More efficient animals are slightly leaner. We wouldn't want to just go after efficiency and then forget about body composition. We wouldn't want animals to become too lean. That might reduce marbling in the product, especially in the quality cuts where the profit is." In the not too distant future, Hill expects bulls at auction to carry a score for efficiency. But that performance measure isn't widely available or standardized just yet.